A Tale of Two Kingdoms is an epic faerie tale, in the classic style of the famous Sierra and LucasArts graphical adventure games. 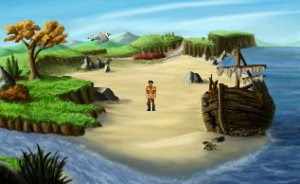 It is a full-length game with an atmosphere of magic and intrigue. Featuring five different endings; several sidequests and alternative solutions; teamwork with non-player characters; 75 minutes of high quality music; and director's commentary. The ancient kingdom of Theylinn is beset by enemies both from within and without. Within the castle walls, nobles vie for the old King's favor, and not everybody is happy with the sole heir to the throne, princess Rhiannon. Meanwhile, danger approaches, in the form of an invading army, a hostile giant, and a mercenary troop who are ancient enemies of the Theylann king. And there is mystery yet. For hidden within the borders of Theylinn lies a second kingdom, named Thierna na Oge, where the faeries reign. Little is known about this shrouded, exotic realm.